Please Send Us Your Testimonials!!!!!!! *Read the Odor-Z-Way® testimonials to see what our customers are saying about our products. You will become a believer after reading all of the Odor-Z-Way® testimonials. 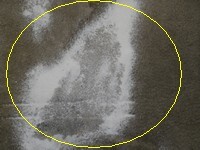 If you scroll to the bottom of the page you will find stain removal pictures with explanations after them!! For questions e-mail us at mjames@odorzway.com or jjames@odorzway.com. I love your product! I have three Basset Hounds ((one or more of whom are not house trained-I'm not sure who the "Old Yellow Stain" offender(s) are)) and I was having a terrible time getting the odor out of my kitchen tile floor. Odor-Z-Way does the trick! If I can get to the urine while it is still wet I sprinkle Odor-Z-Way over it and just let it dry to a white powder. Then I just sweep the powder up! The stain is gone, the urine smell is gone, and clean-up of the powder is a breeze. 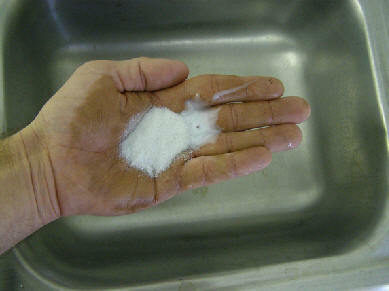 If the stain is dry, I just spritz water over it and sprinkle some Odor-Z-Way over it and let it dry to a white powder. The stain and the odor are gone! I am no longer ashamed to let people in my kitchen. I’ve used Odor-Z-Way for several years now and am thoroughly impressed! I mostly use it to eliminate odors from smelly sneakers, especially after playing tennis or basketball. However, I’ve used it for other household purposes too. Now my shoes stay in the house instead of in the garage where my family used to make me keep them! Recently I have used Odor-Z-Way in the livewell in my boat to remove some viscious odours due to puked-up minnows, dead fish, blood, etc. The smell was so bad that we could smell it even with the livewell closed and the boat moving, so something had to be done! Odor-Z-Way worked its magic. After overnight, the smell was almost gone, and another application cleared it totally. Given the strength of fish smell, especially dead stuff, I had my doubts, but I am now a believer in the efficacy of Odor-Z-Way. I have another testimony for your Odor-Z-Way product. In one of my apartments, there was a red stain in the carpet and we thought we were going to have to replace the whole bedroom carpet. We had shampooed it and tried other spot removers to no avail. I decided to try putting some Odor-Z-Way on it and sprinkled some water on it, then put some more dry Odor-Z-Way on top of it. I let it set for about 36 hours and then scrubbed 95% of it up with just a wet sponge. The tenant then shampooed the spot and got 99% of it out. The carpet was maroon colored, so it is not noticable now. As you well may know, it gets very hot and dry during the summer out here in California. Currently I have 2 cats that are inside cats because of the heat and I live in a heavily populated area. Recently I’ve been having some problems with their litter box stinking. I’ve been using some other products to help keep the odor down but they have not been working very well. I have also been cleaning their litter box out on a more regular basis but this has not seemed to work either. So finally, I have come across your product of Odor-Z-Way. I love this product. I don’t spend so much money on kitty litter anymore and my house doesn’t smell like a dirty litter box either. I will recommend your product to everyone. Thank you for solving my problems! I first want to tell you that you have an amazing product. I usually don’t take the time to write a testimonial but your product works excellent! I recently have moved to Texas and I have three cats that moved with me. I bought your product on-line once I moved into my new apartment to help take care of the odor coming from my cat’s litter box. The product works extremely well. I just sprinkle the Odor-Z-Way in the litter box, mix it around with my scooper, and walk away. It’s very easy to use and works extremely well. I congratulate you on such a great product. I was recently back to my home town visiting my family for the holidays. When I came back home to New York my roommate had adopted a cat for a pet. I wasn’t thrilled by the idea but I went with it. I knew from previous experiences that the worst part was going to be the litter box between the stink and cleaning it. In short, my cousin told me about your product called Odor-Z-Way. I got some on-line and used it as soon as we received the product. Since using Odor-Z-Way, we do not have to clean the litter box near as much and the litter box doesn’t stink up our entire apartment. I have been using your product for a lot of different odors that arise in my house for about 3 years now. I knew your product worked for every other odor I have needed to get rid of, so I decided to put Odor-Z-Way to the real test today in my cat's litter box. The stinch was so overwhelming when I first sprinkled the Odor-Z-Way on the cat litter. I ended up having to leave the house though and came back roughly 4 hours later. I really wasn't paying too much attention but I got to noticing that I do not smell anything. I went over to the litter box and there was absolutely no smell whatsoever. You really do have a truly amazing product. Recently we just acquired a couple of house cats. I cannot believe how bad a cat's litter box can get to smelling. Anyway, to make a long story short, we used Odor-Z-Way in our cat's litter box and it works! My wife and I now keep Odor-Z-Way around all of the time to just keep the odor coming from the litter box knocked down. I just wanted you to know that I used Odorzway for the 14 months that I was in Iraq. I started using it on my clothing because all our clothes smell really bad when they get to Iraq after being secured in a container for 4 months. I just sprinkled some in my foot locker and the next morning my clothes did not smell like a shipping container anymore. I then was living in an area that had a bath room in the back room that the sewer line smelled really bad so I just kept a cup of it on the counter in the back room. Within 2 days the smell was gone so I just kept putting fresh Odorzway out every two weeks to keep the smell down. My guys thought that I had cleaned the area but wondered where the famous smell of pine sol was as the army believes if it smells good it is good. So I kept doing that through the whole deployment in my room. I had one of the trucks that rolled into a canal and while my guys were working on the truck it smelled really bad from the sewer water. I then proceeded to sprinkle some in the vehicle and it cleared the smell up enough that my guys could work on the equipment without having to smell the canal. What a relief to the guys not having to smell that. After all the years that I have used this product, I am still amazed at what it can do and what I continue to find it can do. Thank you, for the opportunity for trying this new product of Odor Z Way. In my 22 years of managing our arena I have not had the experience of using a product like this. Your product works very well and I’m looking forward to using this product in the future. I will be telling my colleagues about this new and exciting product that works! Hi, I just wanted to let you know that your Odor-Z-Way worked! A lady in one of the apartments at Westview was complaining of a musty smell in her apartment. We thought it was probably in the living room carpet because the person that used to live there cooked a lot of greasy foods. We offered to shampoo it for her, but she didn't want it done right away because it was cold out and she couldn't open her apartment to dry it out quickly. She has breathing problems, so the moisture is not good for that. I thought of the Odor-Z-Way and offered to put that on her carpet. We did that and she came back the next day and said that we didn't need to clean her carpet because the smell was gone! So there is proof that it works! Just a brief note to tell you what happened to the package of odor removal powder that I got from you. I tried some of it in a pair of old work shoes that I use around the yard, it worked. The wife stopped complaining about the smell, and I was telling my daughter about it, she yelled, “that’s for me” (she is a state certified athletic trainer that works in a local high school). She has to deal with the athletes and their equipment. She put some of it in the container with their dirty uniforms and smelly equipment. After a couple of hours the odor was gone. She then took some home with her to try on my son-in-law’s police bullet proof-vest that smelled from perspiration. She put some in the bottom of a zippered clothing bag with the vest and the next morning the odor was gone. We have been using Odor-Z-Way at Crossroads Veterinary Clinic regularly for over a year now and have been very impressed with the results. First and foremost this product works great when applied to litter boxes to control urine odor and for easier clean up in the vet clinic. When we arrive at work in the morning most tomcats can really leave a strong odor in the clinic, Odor-Z-Way added to the litter box completely stops unwanted smells. We recently tried it on our carpet where there was a glue stain. We applied Odor-Z-Way on the stain, moistened it with water, rubbed it in and let it set overnight and the stain vacuumed right out. This product is also great to use in our dog kennels to help keep odors down. When we have a pup with Parvovirus enteritis and bloody diarrhea we sprinkle Odor-Z-Way under the plastic kennel mat to absorb odors. As a whole this product works well and we are very happy with it's performance and will continue using it. We recently used your product Odor-Z-Way at our cat neuter clinic. We neutered 56 cats. In the past we have ALWAYS had a clinic that smelled like intact male cat urine for at least 2 days. We used your product right away before we started the cat neuter clinic and we DID NOT smell any intact male cat urine all day or ever. This product is excellent and our clinic will recommend Odor-Z-Way to anyone with odor problems. Thank you for making a great product that actually does what it says and works!!! This is to let you know how great I think your product Odor-Z-Way is for removing nasty cat litter odors. We recently left home for a week on vacation and when we got back the litter box was full to overflowing. The smell was terrible. Even after I cleaned out the box and put in new litter the smell was still awfully strong. It was so bad that anyone going into the basement complained about it. I then sprinkled Odor-Z-Way in the box and on the floor (where there was some spillage) and soon the odors were gone. Thanks for making such a great product -- when you need it, you really need it! Z Two years ago we had a fire at our business. We had a terrible smoke odor so we took Odor-Z-Way off the shelf and sprinkled it all around the burned area and within 1 day all the smoke odor was gone. Since then I have used it in smelly tennis shoes, my refrigerator, our ice chest, etc. and it removes all odors. Odor-Z-Way is a wonderful new product which I will definitely continue to use. Thank you for an excellent product. Z As a rule I do not write letters to companies about products, but in this case I can’t say enough. My husband and I own the Royal Lanes Bowling Alley and café in Phillipsburg, Kansas. Being open to the public we have a lot of smokers. We also have three heavy smokers in our home. Recently, my in-laws from Colorado were visiting, seven people in all, and none of them smokers. They all asked what we were using because they couldn’t smell smoke in our home, business, or car. Needless to say they all bought some before leaving Phillipsburg. Odor-Z-Way should be used in nursing homes. It doesn’t just cover the odor it takes it away completely. Z The way I became associated with Odor-Z-Way involves my clothing store. While reproofing the building with hot tar, I found my customers and my employees were becoming ill with the tar fumes coming into my store. Being very sensitive myself around scented deodorants and candles, I was also overwhelmed with the fumes. Another concern was having that particular smell absorbing into my clothing inventory. In hopes to alleviate the problem, I set small dishes containing Odor-Z-Way throughout the store and sprinkled some on the floor to absorb the odor. After a few hours, the smell was not noticeable and everyone was feeling much better. The next day when I arrived at store I was amazed! Not even a trace of the smell was present. We feel we gave Odor-Z-Way a nearly insurmountable test and it came through with flying colors. I have recommended Odor-Z-Way to my customers and my family for any odor problems they may encounter. As a trucking company we use Odor-Z-Way in a variety of situations to remove odors. It is especially effective in our fleet of semi-trucks, sprinkled in the ashtray and sleeper, Odor-Z-Way removes all odors, including cigarette smoke. It is also used in other company vehicles and personal cars in the same manner. In the office Odor-Z-Way is used by placing an open container in a strategically located area. In restrooms, break rooms, trash cans, refrigerators or any place unwanted odors are present Odor-Z-Way will freshen the air by eliminating the odor. In all, we have had very good luck with this product and will continue to use it in our business. We at Leonard Ford Motors use Odor-Z-Way in our detail shop on a daily basis. Our main uses are on smoky vehicles and pet odors. We sprinkle it on the seats and carpets shut the vehicle up and let it sit for a day. On real strong odors we may have to sprinkle a second time and leave it. But the smell always comes out on the second treatment if needed. It’s so easy to use because you just apply it, let it sit, and then vacuum it up. We have had no problems to date with it staining the upholstery or carpets. Odor-Z-Way works very well and would recommend it to anyone with pets, or getting rid of smoke smells. As I mentioned to you today--we have two St. Bernard's, two cats and up until 2 months ago an 11 year old Great Pyrenees. The Great Pyre's kidney's and bladder were having problems due to age and he was starting to have accidents almost on a daily basis--like always on one spot. We would immediately soak as much up with paper towels (applying pressure to the towels) then we used our hand operated steam vac. over the spot and let dry. Like always there would be a lingering odor. I then tried the following: Once the spotted area was totally dry I sprinkled a liberal amount of Odor-Z-WAY on the spot and immediate surrounding area, working it into the carpet with my hands. We then just let it set for a few days with normal walking traffic over the area--then vacuumed thoroughly. No more detected odors from the spotted area. Just letting you know I was very impressed with your ODOR-Z-WAY product. As you know I drive a fuel transportation truck and trailer and always deal with a strong diesel and gas smell in my truck. Your product did a great job dealing with the problem, especially in the bunk compartment where I store fittings and safety equipment. It is an excellent product. In my pickup I have a rear window that has a tendency to leak when it is raining. One night that it had recently rained was the worst. The water leaked all over my seat in the extended portion of my cab, and then sat in the sun all day the next day with the windows rolled up. Not thinking about it, I went to get into my truck and I had an overwhelming stench hit me in the face. I went for awhile trying to air out my truck but that wasn't working. I decided to put some Odor-Z-Way in to my truck. I sprinkled the product all the way throughout the backseat and all over the floors. Then I let the product sit until the next day. When I got back into my truck the difference was night and day. That nasty stench was completely gone! I am very impressed with what it did for the odors on the inside of my truck. I visited with you or someone from your firm on Friday when you were at the Hays Workforce Center. You left a can of your product for me to try. I didn't think I would need it as soon as I did, but my grandchildren were at my house on Sunday evening, and my grandson vomited on the couch, the carpet, and his clothes. I cleaned up the mess and of course the smell lingered. I used some of the Odor-Z-Way on the spots and in a very short time the odor was eliminated. I have many allergies along with an intolerance for many odors, therefore, I am very interested in using your product, and letting others know about the availability of the product. I live out on a farm by Stuttgart, KS and I have a bunch of farm cats running around. I pulled up to my house the other night and I forgot to roll my driver side window up on my pickup. The next morning I came out to my pickup to head into town to go to work and my truck smelled like cat urine. There was a tom cat that had gotten into my truck and sprayed all over the floor. I couldn't bear the smell any more. I heard about your product and went down to the local veterinary clinic and purchased a can of Odor-Z-Way. I sprinkled some of the product on the floor of my truck and closed the doors. Within 30 minutes that smell was completely gone! I am very impressed with you product. Every year during pheasant season, I have a bunch of my buddies come up to go pheasant hunting. This year they came up and we had a cook out the night before we went out hunting. One of my buddies that came up fed my hunting dog a bunch of greasy food scraps that night. The next morning we headed out hunting and not even thinking about it, we let my dog ride in the cab of the truck with us. Before I knew what happened, my dog had vomited all over my seat. We immediately cleaned up the bulk of the mess, but it still left a nasty stink inside the cab of my truck. So, we continued to hunt for the next two days with the windows down in about 20 degree weather. As we pulled up to our last field that we were going to walk, I remembered that I had purchased a bottle of your Odor-Z-Way and left it behind the back seat of my truck. While everyone went to walk the field, I stayed behind and sprinkled some of this product on the area where the dog had vomited. I didn't tell everyone else that I had done this. About 15 minutes later when they had returned, and gotten back into my truck and they couldn't believe that they could not smell anything. That stuff took the smell of that dog vomit completely out of my truck. This stuff really works and I want to thank you. Recently, I was out of town for a few weeks and my friend was coming to my home to feed and care for my two cats. Well, during my absence the cats urinated on a blanket that had been lying on the floor of my living room, completely saturating the blanket and the carpet and padding underneath. I tried as many of the over the counter products that I could find and the odor would disappear for a little while and then return full force. I was telling my neighbor about this problem and she had some of your product and told me to give it a try. I applied the product, rubbed it in to the carpet and let it sit overnight. Then I vacuumed it up. The smell was not completely gone but definitely diminished. I reapplied the product and then let it sit again for two nights, again I vacuumed it well and this time there was no odor! I was totally impressed! Little did I know that I would be using the product again within two days. A few nights later, I contracted a stomach virus. The virus made me ill and then a few hours later made my son ill. At about 10:30 that evening, my son vomited all over my bed sheets and comforter and himself. I stripped my bed and put my linens in the wash and removed all solid matter from the bed and then applied the Odor-z-way to the wet spot on my mattress, let it sit for a night and then vacuumed it up. I have never once after that smelled anything on my mattress from that incident. I am truly amazed and satisfied with your product for odor removal and would not hesitate to recommend it to anyone! 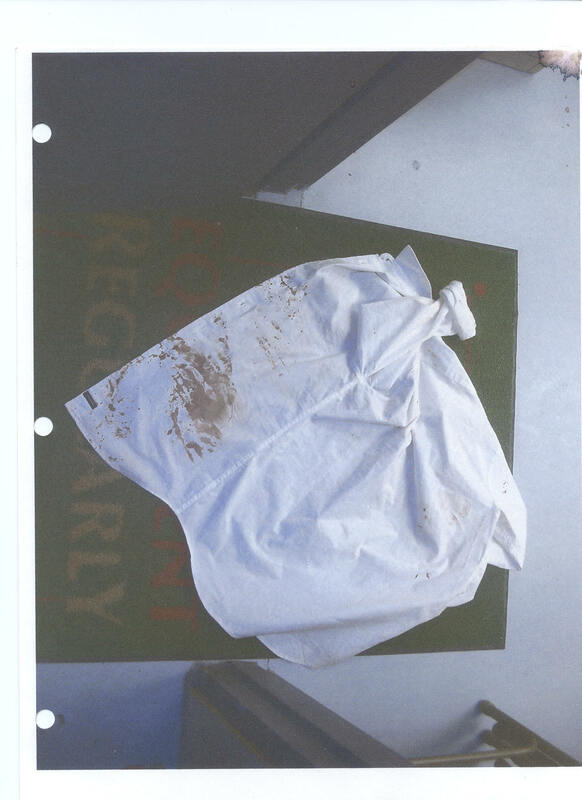 1) In the first picture, is a shirt that has blood on it, which has been dried for five days. The shirt has had no treatment done to it. 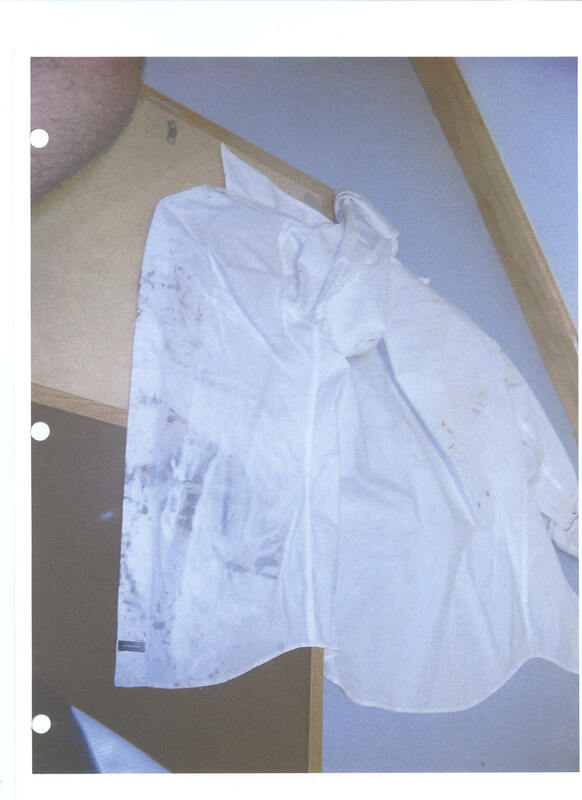 2) In the second picture we have gone in and dampened the shirt with water where the blood is present. We did not soak the shirt with water though. We just added enough water to make the affected area damp. We then took Odor-Z-Way and added the product to the affected area where blood is present. We then rubbed in the Odor-Z-Way so it would come in contact with all of the fabric. 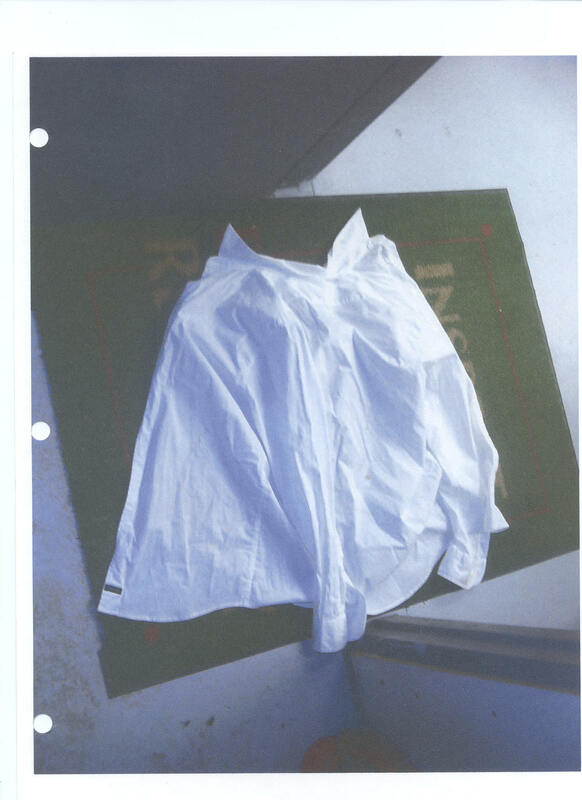 After adding the Odor-Z-Way, we just let the shirt sit until it had completely dried. 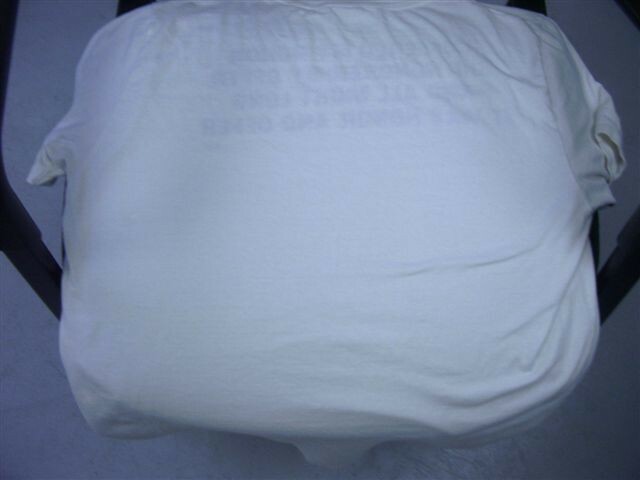 3) Once the shirt had dried completely, we washed the shirt in the wash machine. The third picture shows after one wash the blood has been completely removed and we now have a brand new shirt once again. 1) These two pictures are from a mechanics shop where he had machinery sitting for about four years. The machinery leaked oil all over his concrete floor and stained the floor. The mechanic had tried everything he could think of to remove the oil from the concrete. 2) The first picture (Left) shows the concrete floor before anything had been done to it. The bottom right area is the area that is going to be treated. This area is highlighted in yellow. 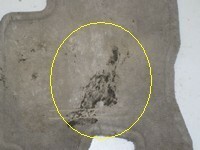 3) In the second picture (Right) Look at the right bottom side of the oil stain. We took and added a thin layer of solvent to the effected area to soften the oil. We then added the Auto Odor-Z-Way to the effected area. Once the Auto Odor-Z-Way was added we rubbed the product in with our foot. In 5 minutes worth of work while we were talking we cleaned the entire spot. 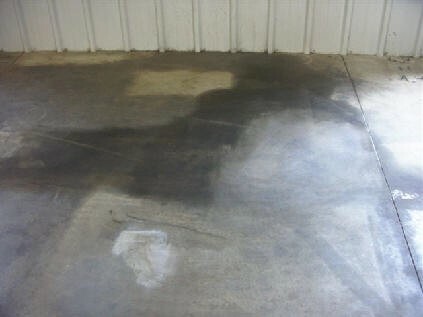 If you look at the pile of Auto Odor-Z-Way you can see how the product has changed from a white color to a brown color. This shows that the Auto Odor-Z-Way absorbed the oil and held it. 1) In the top and bottom left pictures there is a shirt that has chewing tobacco stains (highlighted in red) on the front and back. These stains are unique because the shirt was thrown into a dryer and a chewing tobacco can was in a pair of pants that the individual also threw in. So, these stains have actually been dried and set into the shirt. 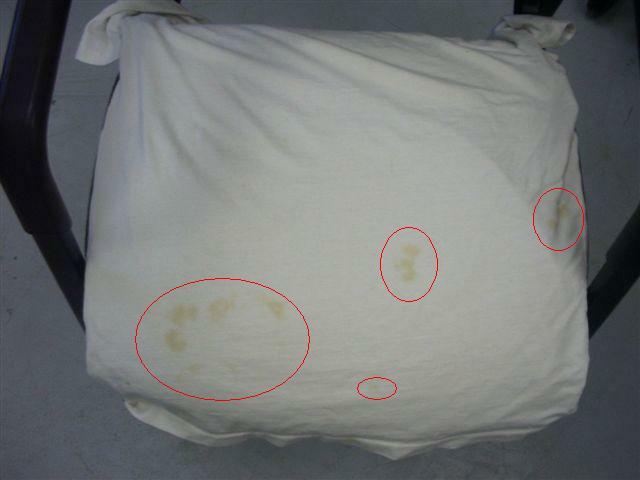 2) We took the shirt and dampened the affected area with water where the chew stains were present. Next, we added the Home Odor-Z-Way to the affected areas and rubbed the product in. We then let the shirt sit until the shirt was completely dried. 3) Since the shirt had been thrown in the dryer and had the stain set in, I decided to treat the shirt twice before I tried washing it. 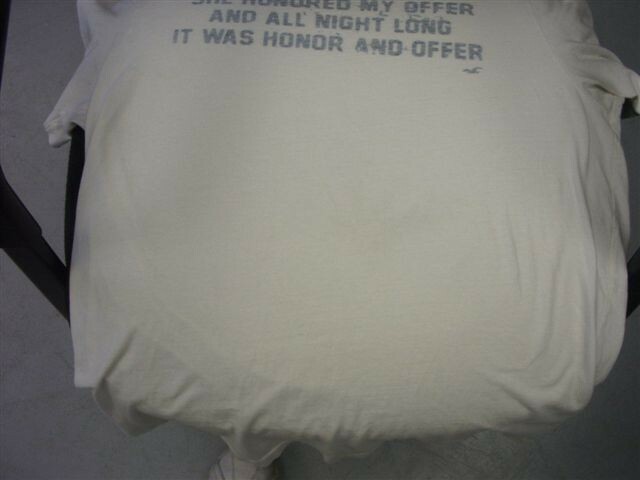 I took the shirt and dumped the used Home Odor-Z-Way off of the shirt. I then repeated what I did before by dampening the affected areas with water, adding fresh Home Odor-Z-Way to the affected areas, and rubbing the product in so it comes into contact deep into the fabric. Once again I let the shirt sit until it was dried. 4) I took the shirt home and washed it one time with just soap in cold water. The right top and bottom pictures show the shirt after one wash. The stain is completely gone out of the shirt. 1) In the first picture there is an iodine stain in the bottom left corner of the picture from a person getting an epidermal shot to keep from getting infection. When having this shot this person obtained iodine on their pants. Usually when this has happened in the past this person claims that their clothing has been stained and ruined. 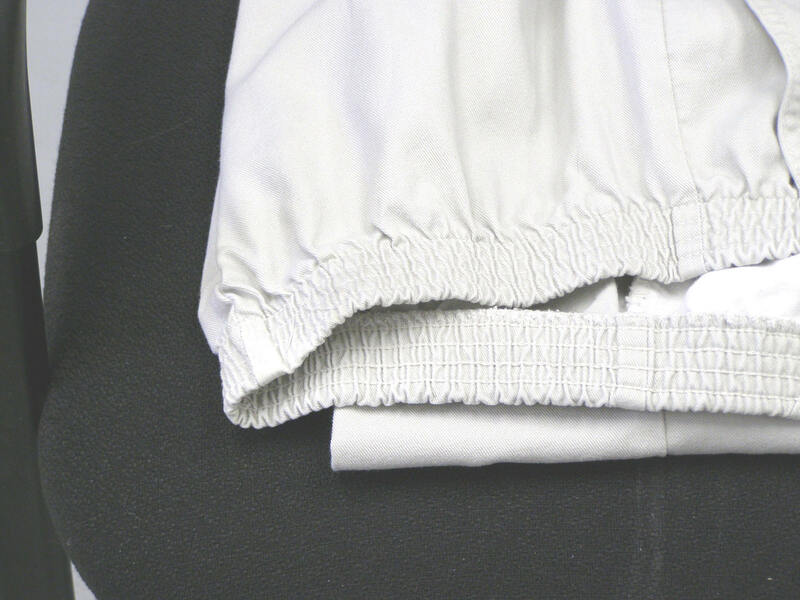 The pants have not been washed or dried before any treatment is done. 2) In the second picture you can see where we have gone in and wet down the dry iodine with some water. We did not soak the stain, we just dampened the stain with a mister. Next we applied the Home Odor-Z-Way onto the spot. 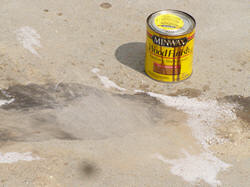 We then rubbed the Home Odor-Z-Way into the spot so that the product will come in contact deep into the fabric. Of course, the stain has soaked in through the back side of the pants, so we made sure that we treated both sides. 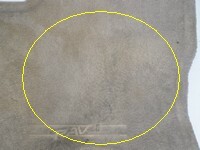 As we rubbed the Home Odor-Z-Way into the stain you could see the product changing colors to a yellowish color. This indicated that the Home Odor-Z-Way was already pulling the stain out of the pants. The stain finally dried and the stain was still there but it was lighter. So, we followed the same steps again as explained before. We let the pants dry again and the stain was a little lighter again. So, for the third time we repeated what we had done before once again. This time when the pants had dried, we shook all of the product out of the pants. 3) In the third picture you see a brand new, stain free pair of pants. After three applications the stain has been completely removed. We did not wash the pants at all. This was all done by the work of the Home Odor-Z-Way. The reason this stain took a little longer is because the iodine had soaked all of the way through the thick part of the pants. 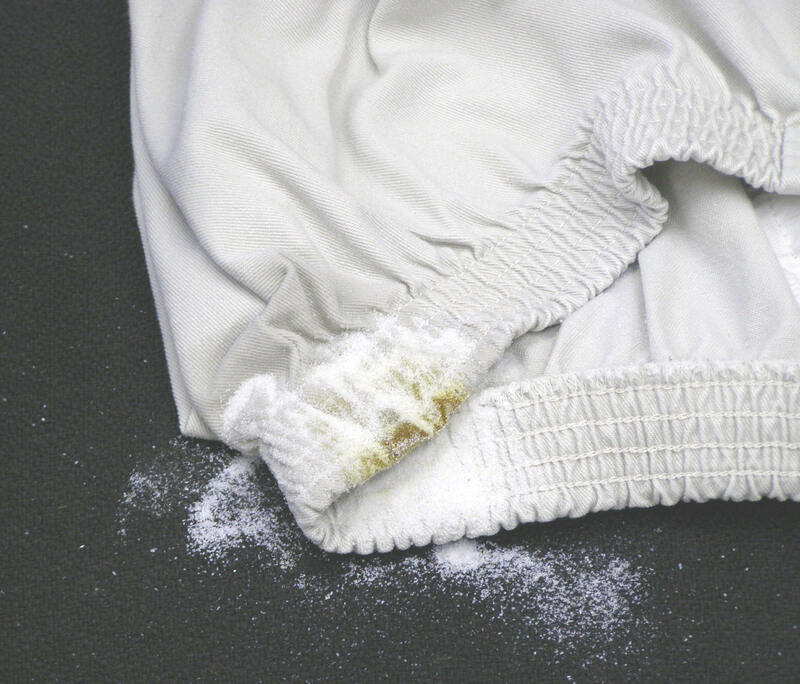 What the Home Odor-Z-Way did was absorb the stain continuously until it was worked completely out from the middle of the pants. This is why this stain took a little longer to remove. 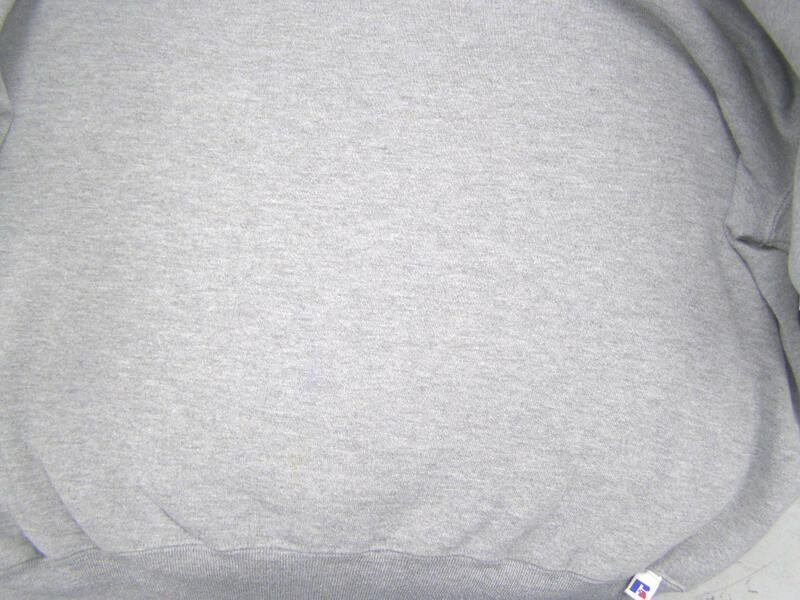 1) The first picture on the left is a gray sweat shirt that had a blue ink pen break on the shirt. 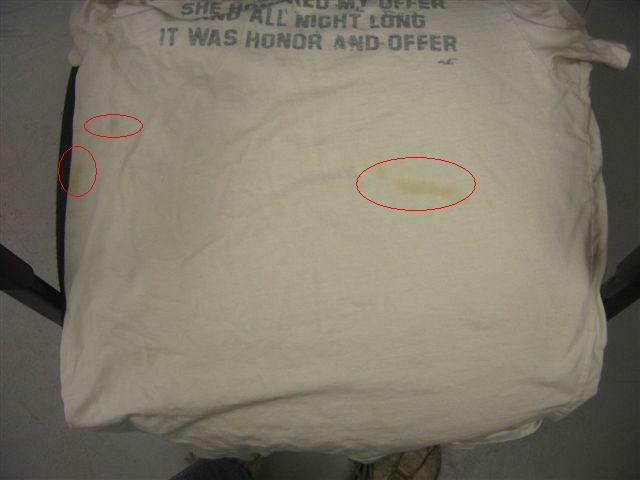 The ink was dried before any treatment was done to the shirt. 2) In the second picture (middle) I have taken some regular general-purpose lacquer thinner and added to the spot on the shirt. Immediately after adding the lacquer thinner, I added some Home Odor-Z-Way to the affected area. I then rubbed the Home Odor-Z-Way into the spot. After rubbing the Home Odor-Z-Way in, I shook out the shirt because the Odor-Z-Way had turned a blue color indicating that the ink was being absorbed. Not all of the ink came out, so I repeated this process two more times. 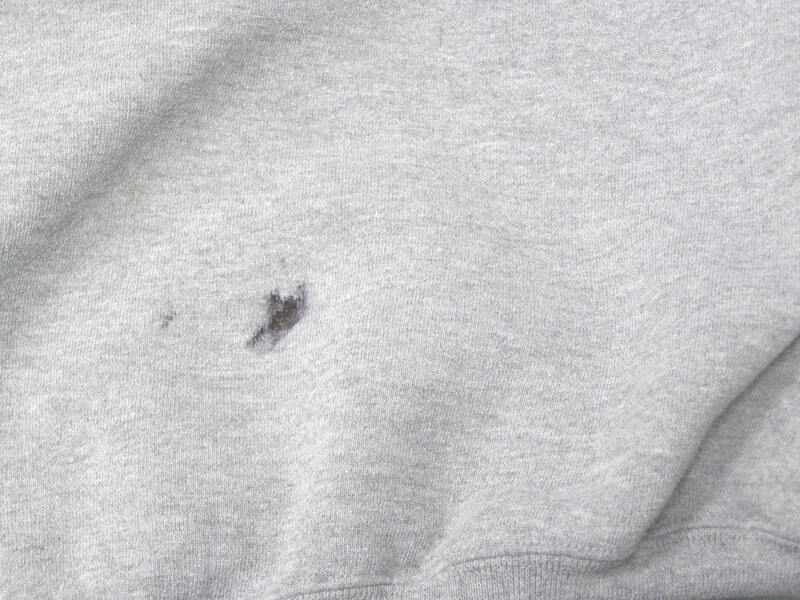 3) The third picture (far right) shows how the Home Odor-Z-Way and lacquer thinner cut the ink out and saved the sweat shirt. With using the lacquer thinner, the ink was now able to break down and be absorbed by the Odor-Z-Way. The Odor-Z-Way not only pulled the ink, but also pulled the lacquer thinner odor. 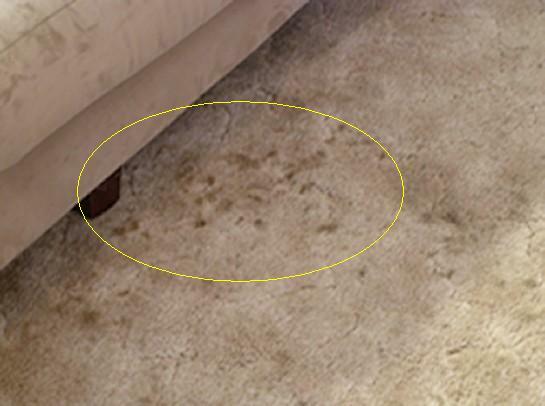 1) In the picture on the left you can see an area on the carpet (outlined in yellow) that has obtained some type of spotted stains. More than likely something had been spilt here at one time. 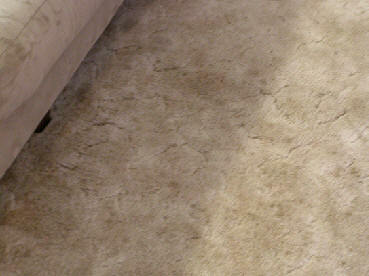 This area had previously been cleaned by a carpet cleaner and was unable to pull out the stain. 2) Assuming that the stain was water based, we took a damp cloth and blotched the spotted area until the carpet was damp to the touch. 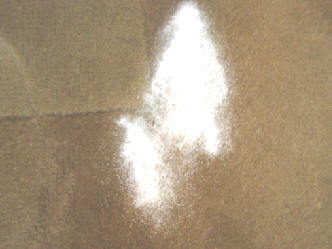 3) We then took the Home Odor-Z-Way and sprinkled the product generously over the spotted area. 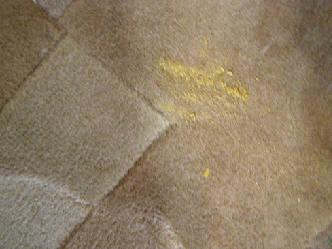 4) After sprinkling Odor-Z-Way over the affected area, we took our foot and rubbed the Odor-Z-Way into the carpet. This works the Odor-Z-Way in, so the product comes in contact deep into the fibers of the carpet. 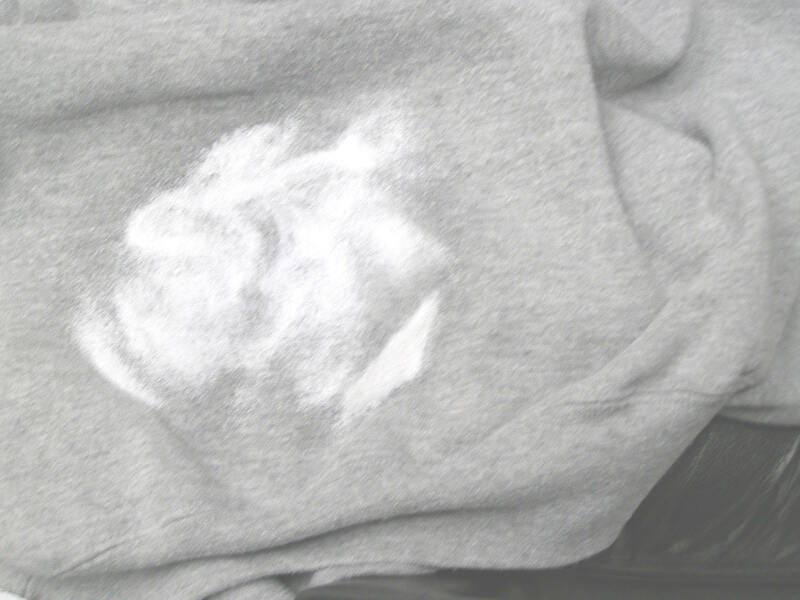 5) In less than a 30 seconds the stains were completely gone, as shown by the picture to the right. To remove the Odor-Z-Way from the carpet, we used a vacuum and disposed the product in the trash can. 1) In the far left picture is a rug that has obtained cat vomit. As you can see there is some stain and fine particles left in the rug. 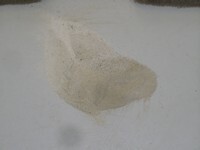 2) The first step for this procedure is to pick up the bulk of the mess. This will allow the Odor-Z-Way to get to the stain and be effective. Next, dampen the area with water but do not soak the stained area. You want to use water because vomit is a water based stain. 3) For the third step (middle picture), you want to apply the Odor-Z-Way generously over the affected area. 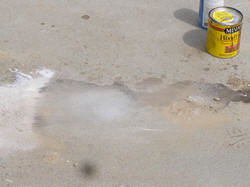 As you can see, you want to completely cover the stained area with Odor-Z-Way. Next, rub the Odor-Z-Way in with your foot, a brush, etc. You might need to add a little extra after the first initial rub in. Once the Odor-Z-Way is rubbed in, let the affected area sit over night or until dried. 4) Last of all you will want to vacuum the Odor-Z-Way out of you carpet. As shown in the 3rd picture (far right), the stain is completely gone after vacuuming up. To dispose of the contents that were vacuumed up, just throw away in the trash. 1) The first picture shows a person's clean hand before they stain a piece of wood. 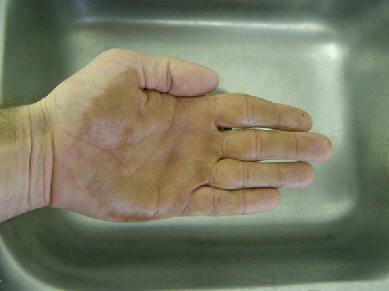 2) Picture two shows the person's hand once they have finished their staining job. 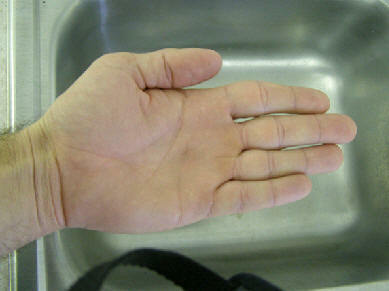 Usually it is hard to get the stain out of your hand without using chemicals and a lot of scrubbing. This is where Odor-Z-Way comes into play. 3) In picture three, the person has taken a squirt of liquid soap and added roughly a palm full of Odor-Z-Way into their hand. They then added a litter water to dampen their hands, as you usually would when you wash your hands. 4) The fourth picture shows how the Odor-Z-Way, soap, and water have been worked into the hand to remove the wood stain. You can see a slight tint of brown color which is the Odor-Z-Way absorbing the wood stain. 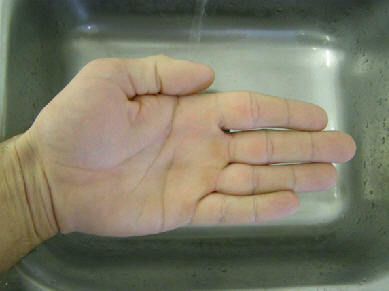 5) The last picture shows the hand completely clean after rinsing off. This process takes less than one minute to do. The process is also much safer on your skin and less time consuming. 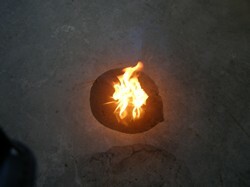 3) Picture three shows Odor-Z-Way being applied to the gas fire. You can see how the fire has started to weaken when the Odor-Z-Way is added. 4) The fourth picture shows the Odor-Z-Way continuing to be added and the fire is getting weaker and weaker. 5) The last picture shows the Odor-Z-Way completely covering the gas spot and the fire completely extinguished. -- This experiment was done in a matter of 10 seconds. With the absorption capability that the Odor-Z-Way has, it absorbs the petroleum vapors in a matter of seconds. 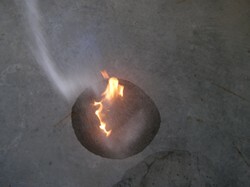 Of course, this extinguishes the fire and the gas does not burn once absorbed into the crystal. 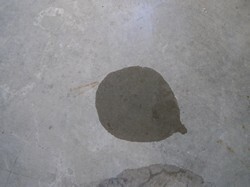 Picture 1 – This picture shows a spill from wood stain that has been sitting on the cement for 1 hour. Picture 2 – Since wood stain is oil based, we took some lacquer thinner and poured onto the spill. We then added Odor-Z-Way over the spill and the lacquer thinner. 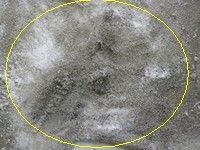 Picture 3 – We rubbed the Odor-Z-Way into the affected area with our shoe. You can use a wire brush, your foot, etc. to rub the Odor-Z-Way in with. This was the first application and you can see where the Odor-Z-Way took the wood stain right out of the cement on the first try. This took us about 15 seconds to do. Picture 4 – Here we repeated the procedure one more time on the same spot. 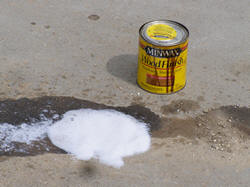 After sweeping the Odor-Z-Way off of what once was the affected area, you can see that the cement has been cleaned even more after a second application to make the cement look almost brand new. 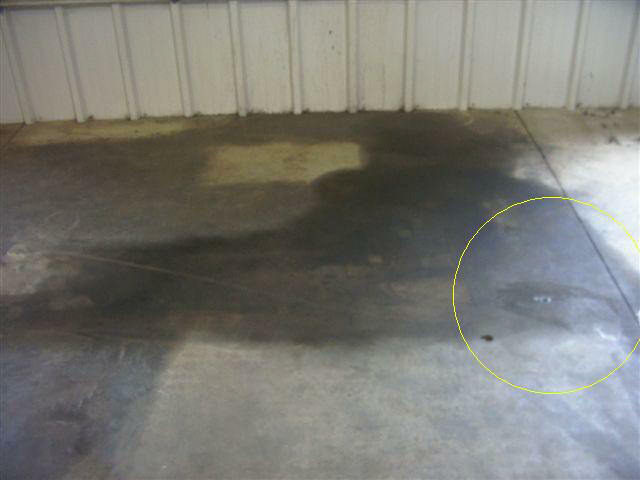 Picture 1 - In this picture you can see a floor mat that has a lot of grease smeared on it. The grease has been on the mat for about 5 days without any treatment. 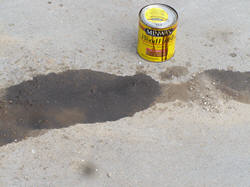 Picture 2 - Since you need something to loosen the grease so that the Odor-Z-Way can remove the grease out of the mat, I took an industrial solvent called Imperial Cleaner and poured all over the grease. I did not soak the grease area with the solvent, I just dampened it. I then waited about a minute to let the solvent soak in. Picture 3 - I now apply the Odor-Z-Way to the grease stain. I just sprinkle the Odor-Z-Way over the grease stain until I have a good amount of Odor-Z-Way to rub in. You can see how the Odor-Z-Way starts to absorb the solvent very quickly. In the middle of this picture the Odor-Z-Way is raised up and no longer white which means the product has begun to absorb. 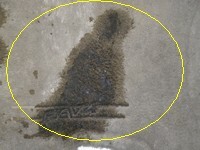 Picture 4 - This picture shows how the Odor-Z-Way has been rubbed into the grease stain. When you do this, you want to take a brush or use your foot to rub the Odor-Z-Way in. In this case I just used my foot and rubbed the Odor-Z-Way in. After rubbing the Odor-Z-Way in, if it looks like you need to add a little more product to rub in feel free to do so. Once the product is rubbed into the affected area leave the spot sit until dried or over night. The next day you can vacuum the mat or shake it out. 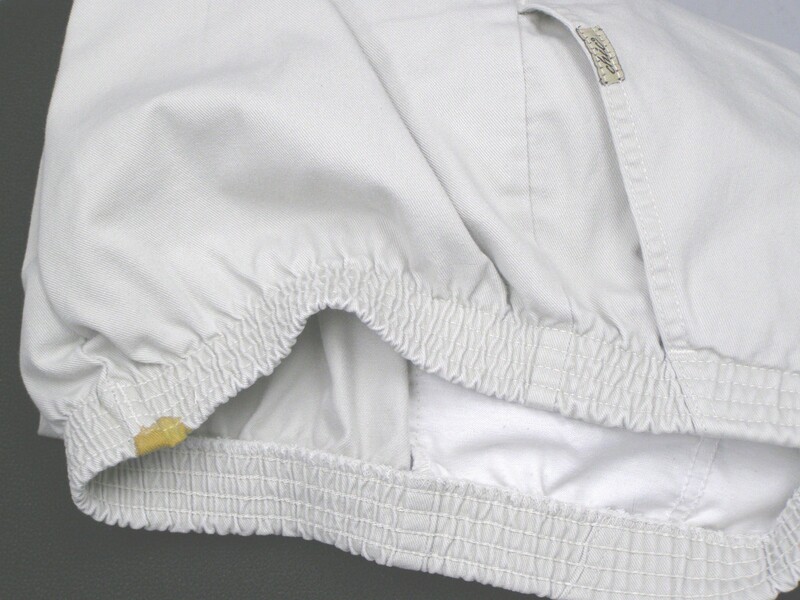 Picture 5 - The Odor-Z-Way is originally white in appearance. 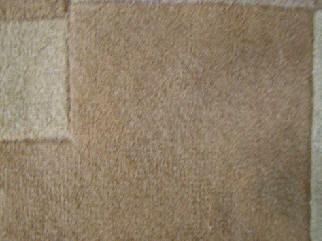 In this picture you can see how the Odor-Z-Way has absorbed the grease out of the carpet mat. The product is now brown showing that it has absorbed the grease. Picture 6 - This last picture shows the finished product of the mat. The grease is almost completely gone after one application. If you look very closely you can see just a little bit of grease left. If you repeat these steps one more time, you will completely remove the grease and have a mat that is as good as new again.